We meet on Sundays at 9.30am in the primary school auditorium of Quinns Baptist College. Our Sunday gatherings are casual in nature where we come together to worship, learn and connect with one another and God. Most weeks involve some singing, prayer and a talk from one of the crew. Sometimes its a regular ‘sermon type’ gig and other weeks its interactive and participatory. We believe there are many ways to worship, learn and connect so we try to vary things quite a bit. Some weeks we will not have a regular service, but will just have brunch together. 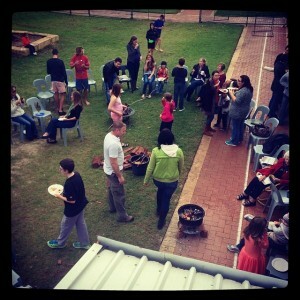 Some weeks we meet with the school for their start and end of year functions. There is a fantastic kids’ program for children aged from PP – Y6, that runs during the second half of the meeting and kids are welcome to leave the service and join in. The children worship and are engaged in a story or theme together before splitting into two groups for arts, crafts, puzzles, games and more in-depth Bible teaching. Totzone is where the youngest members of our church family meet. Children aged from babies to kindy meet to play, hear and take part in storytelling, sing, dance and do arts and crafts.